Are the Bears grasping at straws for a QB? The Chicago Bears confused analysts and fans Thursday night when they traded up with San Francisco to draft North Carolina quarterback Mitchell Trubisky 2nd overall in the 2017 NFL draft. Analysts, fans, and even myself thought that the Bears would likely take one of the elite defensive players such as Jamaal Adams (safety), Marshon Lattimore (corner), or Solomon Thomas (defensive end). It was unlikely that Myles Garrett would still be on the board at no. 3, but at least one or two of those other players would be. The Chicago Bears traded up with the 49ers to draft NCU QB Mitch Trubisky no. 2 overall. The Bears desperately need help in their defensive secondary, especially considering the elite passers that are in their division (Aaron Rodgers, Matt Stafford, and maybe even Teddy Bridgewater if he returns healthy). They did pick up Prince Amukamara (CB), Markcus Cooper (CB), and Quintin Demps (S) in free agency to add some depth, but they still need more help at those positions. If a safety or corner wasn't available, then an elite pass rusher that could pressure those rival QBs would be the next best thing. The Bears offense actually moved the ball pretty well towards the end of the season, scoring 20 or more points in 4 of their last 5 games. The problem was their defensive was giving up 30 or 40 points. 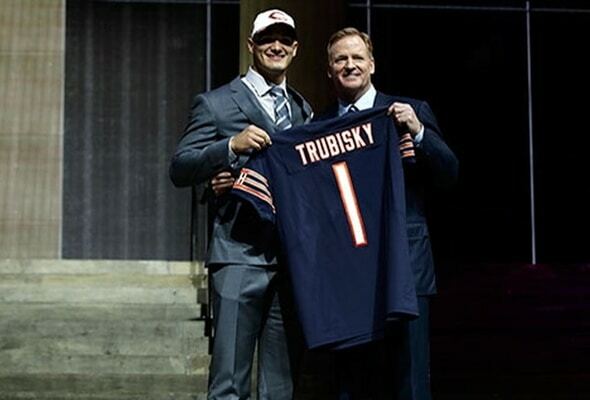 I'm not complaining about drafting Trubisky. I like the pick, and the Bears need a quarterback. I just think that the Bears have severely overpaid for it considering their earlier offseason moves, and that a defensive star should have been higher priority. Everyone seemed to think that the 49ers were going for Solomon Thomas -- or maybe Jamaal Adams. And, in fact, the 49ers did use their number 3 overall pick to get Thomas after all. So it seems (on the surface) that Trubisky would still be there for the Bears at number 3 if the Bears wanted him. NFL analysts and fans were dumbfounded by the Bears' first round draft trade. Maybe the Bears were tipped off that someone like the Jaguars were offering a trade with San Fran to get Trubisky? Maybe the Jags were worried about Chicago picking Trubisky at number 3 and wanted to leapfrog to get him? Or maybe the Jets were looking to trade up? That's the only way that this trade makes sense. Or maybe the 49ers outright swindled the Bears? The Bears gave up this year's third and fourth round picks, as well as another third round pick next year, so this was a pretty costly trade considering they only moved up one spot, and the 49ers got a super-sweet deal. They got the guy they wanted all along, and they get two more mid-draft picks to fill other needs or as capital to trade. Who is the real prey in Bloodborne: the Card Game? It seems like everything has a board game these days. I wouldn't think that a license like Dark Souls or Bloodborne would warrant a board / card game adaptation, but apparently, I'm just not creative enough. The kickstarted Dark Souls board game is shaping up to be something similar to Descent, and is slated for release later this year. 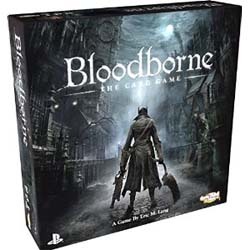 Bloodborne, on the other hand, already has a card game sitting on the shelf of a hobby store near you since last year. A copy of the game showed up under my Christmas tree this year. 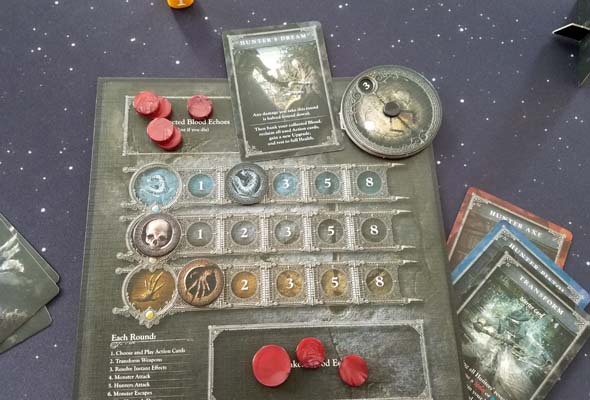 Bloodborne: the Card Game Is very easy to learn, and it plays very fast and smooth! This is good, since most of my games are epic-length, 4-plus-hour games that we rarely have time to play. So it's always good to find a new game that people like and which can be played in an hour or less. Our first learning game of Bloodborne (including reading the rules) took about an hour and a half. We had planned on playing a sample round to learn the rules and then doing a mulligan on the game, but we didn't even need to because the game process is so simple that we all grasped the basic mechanics pretty much immediately. The game is a competitive card drafting game in which players sort-of cooperate to defeat a series of monsters, but compete against each other to score the most points. It's basically a Bloodborne-themed reskin of Cutthroat Caverns. Thematically, each player takes on the role of a hunter, the group fights a series of monsters in a Chalice Dungeon, and the hunters acquire Blood Echoes (points) by fighting and killing the monsters. Blood Echoes are directly earned by damaging a monster with a weapon attack. 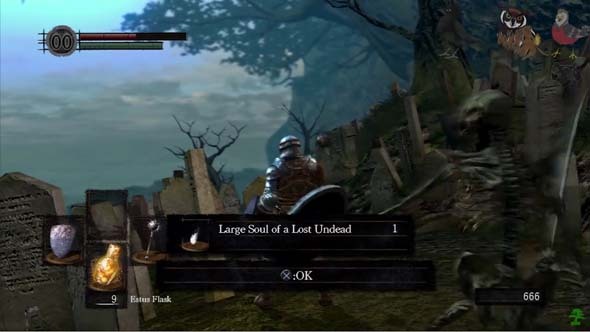 Each player who deals damage to a monster in the round in which the monster is killed also gains one or more trophies (based on the strength of the monster), which are converted to Blood Echoes at the end of the game for scoring. You're playing for Blood Echoes, which are lost if you die - unless you bank them in the Hunter's Dream. 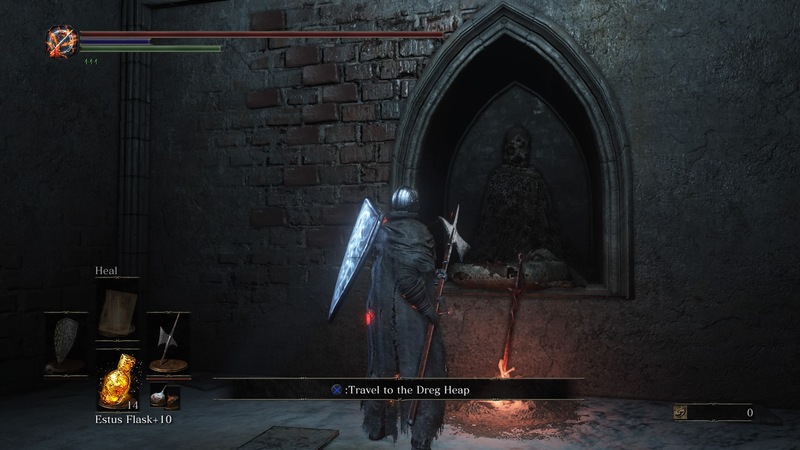 The major mechanical gimmick of this game (and the one that is most inspired by the source material, and which most separates it from Cutthroat Caverns) is that when a player's character dies, that character loses all of his or her collected Blood Echoes, and then resurrects to fight again the next round. 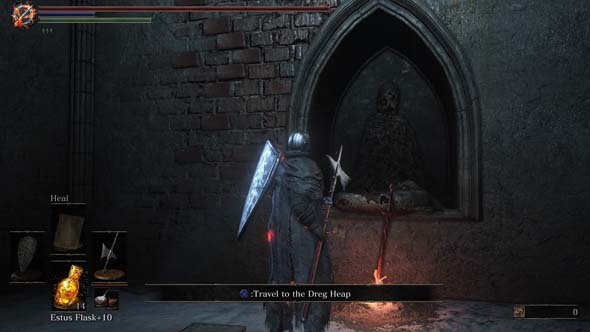 However, a player can use an action during the round to return to the Hunter's Dream and bank their collected Blood Echoes so that they cannot be lost. While in the Hunter's Dream, a player can also select new cards to add to his or her hand, and going to the Hunter's Dream is the only way to cycle your previously-played cards back into your hand. The drawback, of course, is that you can't participate in the fight and gain more blood. It's a risk / reward mechanic, and it works very well.